Where shall we go next? What country can we explore? 360cities allows you to virtually visit many places of interest and view their spectacular panoramic photos. The photos are a full interactive shot of the scenery so you do get to see everything. You are also able to create your own panoramic shots and upload your pictures. you could provide students an image and challenge them to create a virtual tour. Record the tours as a screencast. Use the “how-to” section to have your students create their own panoramic pictures. At a cost of $1.99, this is an excellent app. 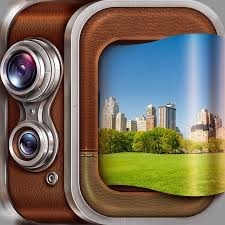 Pic Collage is a free photo collage app that lets you create photo collages instantly and very easily from your iPad. It is a very useful app to use in the languages class as you can get your students to create collages with text on almost any topic. 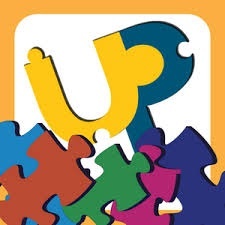 Recently I used this app with my Year 8 class on the topic on “Family”. Students took photos of themselves, family members and pets, rearranged the photos onto their Pic Collage and then added sentences. It is a useful tool that encourages writing. Students also enjoyed adding text effects and stickers. Once completed students saved their collage into their camera roll so the could upload into their Dropbox. Usually, I do not print student work, but as their posters were personal as well as colourful, I did print out their work and gave the printouts to the class homeroom teacher. He promptly put the posters on display in his classroom, which had the effect of bringing the target language into the students’ homeroom. The app is free and very easy to use, as well as adding images and text you can also change themes, add filters, cutouts, borders, text effects, and stickers. Tellagami is an app that allows uers to create video content on their ipad. It allows for the the combination of voice and photo backgrounds to create customised 3D avatars. It is another fun way of encouraging digital storytelling, as well as speaking, reading and writing in the languages classroom. Last week I gave this app a go in my Year 7 class. Students were to write a script about our current topic “Kamu melakukan apa?” “What are you doing?”, and then get their script proofread and corrected by me. Once the script was completed, students were to create their 3D avatar Tellagami, complete with their voice recording. This is a sample of my student’s work. I really liked using Tellagami in my classroom as it is a very simple app to use, and the process of actually creating a movie similar to my student sample is quite fast and very easy. Users have the option of picking the gender of their avatar, and then have the option of changing their avatar’s facial attributes, emotions, clothing and background image. For the background you can use an image from your camera roll or select one of the apps pre-loaded options. There is a limitation in that you can only audio record scenes for 30 seconds. However, if you wanted to make a longer movie, you can save your 30 second scenes into your camera roll and then use them in another app like iMovie. This is a really fun app and my students were very excited in the prospect of creating their own talking avatar. It is an excellent app that really engaged my students and assisted them in learning a language. Thinglink is a free app which allows users to add text and videos to an image. Yesterday I trialled using this app in my Year 9 Indonesian classroom to great success. I supplied students with a image on our current unit, “A visit to a village” and then asked students to label the image with as many words as they could. Once completed, as a class we had a brainstorming session where students volunteered their words. By the end of the activity students added more sentences and words to their Thinglink image, revised on words previously learnt, and with the prompts from me, added new words to their existing vocabulary. This link is a sample of a student’s work. Thinglink is very easy to use, students select an image and then tap where they want to add text. I would definitely consider using this app in my classroom again as it does encourage writing and speaking. My language class is often loud, and ordinarily I do not have a problem with this as learning a language obviously involves students speaking and communicating with each other. In fact, it is an absolute joy to see my students actively participating in speaking and language games and associated activities, however there are times when I do need to manage the noise level to a more comfortable level. This is where the Too Noisy app becomes a very useful addition to the teacher’s toolkit. This cute iPad app has been designed to assist teachers keep the noise levels in the classroom under control in a fun and engaging way. It does take the negative focus away the teacher, which I quite appreciate, because as the noise levels increase in a classroom and reach an unacceptable level the background graphics change to reflect this and this gives a visual indication to the students that the classroom has become too noisy without teacher intervention. The background picture changes as the noise level lowers or rises. As some activities in a classroom can have a higher level of acceptable noise, the sensitivity of the app can be adjusted to suit. This app is free, however if you buy the paid version called Too Noisy Pro it has the same background but when the noise gets too loud it looks like the screen cracks and has a loud noise to get the attention of the children. Again the app I am reviewing is not a languages app, however, it is a very useful addition to add to your teacher’s repertoire. I am increasingly becoming more reliant on my iPad in the classroom, not just for teaching but also for administrative tasks, so much so I no longer take my laptop to any of my classes and long gone are the days where I take a CD player to class. I do my online roll marking with an app, all my sound files are stored in my iTunes library which I can access whenever I want and most of the student activities are done with various apps. However while I am enamoured with my iPad I still do use my laptop quite often, as both of these devices have their best uses. This is where I like using Splashtop 2. Have you ever had the occasion where you are in class and about to start an activity only to realise that you have left the activity in your office? Or perhaps you want to show a DVD but forgot the actual DVD. As much as I don’t want to admit it, this has happened to me, thankfully not regularly, however I have found myself in that position. Splashtop 2 enables you to, from your ipad, access another computer, and then take control of the secondary device. You can project your manipulations to Apple TV or via a digital projector. While there are numerous ways to access your computer from anywhere, such as VNC or LogMeIn, Splashtop 2 is unique in that it emphasises multimedia, and is capable of streaming audio as well as video. That means, if I want to show a DVD, all I need to do is load the DVD into the DVD drive on my laptop, and when I am ready to show it, I can do so from any location providing it is on the same network. To use this app you must first download the Splashtop Streamer for the computer(s) you would like to access. Once installed, you need to create a login for the Splashtop service. As mentioned, you need to be on the same Wifi network as your computer in order to use the free version, however you do have the option to purchase the “Anywhere Access Pack” that provides connection regardless of the network. I believe this is a great app in the teachers toolkit, as it gives you access to all your documents held on your laptop or PC, and for free you can access from anywhere within your school network at anytime.